Aww geez, this isn’t exactly how I wanted my first trade of the year to turn out. After a bunch of tries, AUD/USD just couldn’t quite make it to my first profit target near 1.0700. 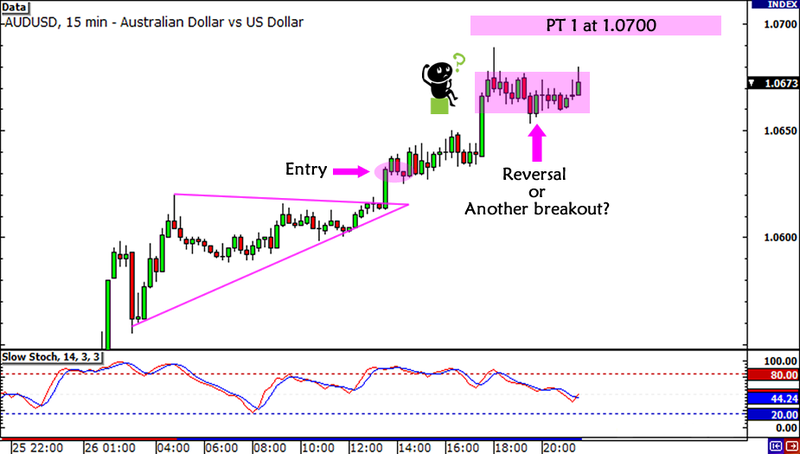 As you can see from the chart below, it even came a few pips close at 1.0689! I probably should’ve exited this trade early when I had the chance and locked in the few profits that I had back then. It looked like the pair was having a hard time continuing its rally towards the end of the week, but I was crossing my fingers that the U.S. GDP would give it another boost. Sadly, the GDP figure failed to meet expectations and AUD/USD was forced to retreat. Also, I should’ve closed my trade before the end of the week as I promised in my trading resolutions for the year. Oh, stubborn me! The thing is, as I mentioned in my earlier trade update, the technicals were still signaling an Aussie rally as shown by the bullish divergence at the 38.2% Fib level. Do you think it’s the end of AUD/USD’s rally? Should I switch sides and join the bear camp now? I’d love to hear your thoughts to help me bounce back this week. Looking forward to your tips! Okay, maybe I shouldn’t have counted my eggs before they hatched. Unfortunately for my trade, AUD/USD hasn’t quite broken its highs near my first profit target. 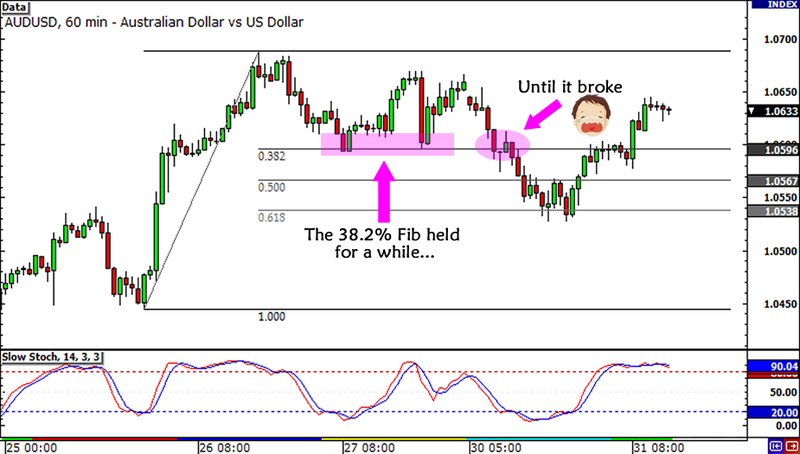 In fact, it has even went down by a few pips below my entry level! 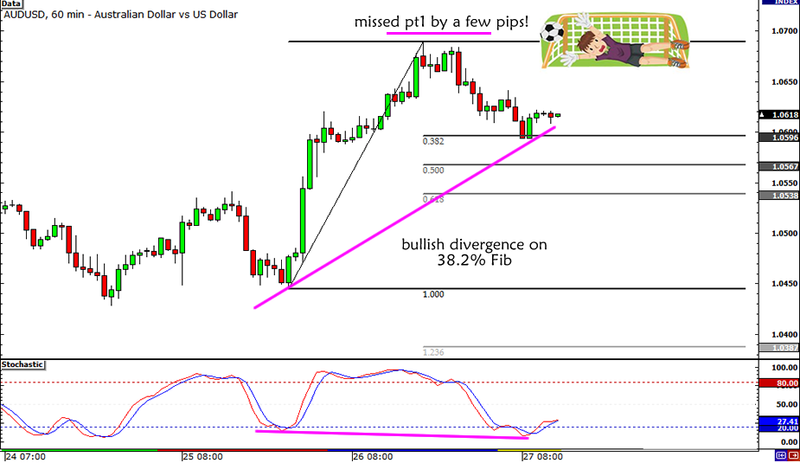 Good thing I spotted a bullish divergence on the 1-hour chart, which is supported by an overbought Stochastic signal. The Fib levels are still within my original stop loss area, so I’m keeping my positions open for now. I’ll watch out for the big U.S. GDP report coming up in a few hours though. Word from my forex friends is that it’s expected to come in a bit weaker than many are expecting, so I’ll probably close my position if it takes its toll on risk sentiment later. However, if the report turns out stronger than estimates, then I will keep my position open and consider locking in a few pips before the week ends. So, what do you think of my plan? Do you think it’s okay to wait for the reports later, or should I just close all my positions now? A few hours ago I entered a long AUD/USD trade at market on the belief that the pair will continue to shoot up during the London session. The trade idea worked pretty well for a couple of hours, but now the pair is stalling and even forming a rectangle near the 1.0670 area, about 30 pips away from my first profit target at 1.0700. The question is, are we seeing a reversal, or just a pause before another rally? My forex friends told me that investors are currently focusing on the good news and shrugging off the bad news. Heck, the weak initial jobless claims report isn’t standing a chance against the strong durable goods data! Should I hold on to my trade, or take profits early? This is my first actual trade for the year, so I’m really crossing my fingers for a win! Any advice would be much appreciated! After my AUD/USD and NZD/USD trade setups didn’t get triggered, I’ve decided to be more aggressive this time as I already pulled the trigger on my long AUD/USD trade. Check out this breakout setup that I spotted! 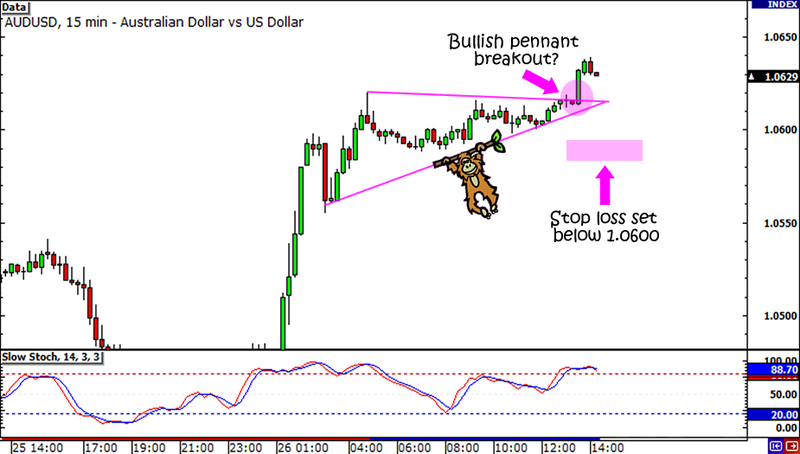 AUD/USD staged a strong rally yesterday when the Greenback sold off after the FOMC statement. It turns out that the Fed plans to keep rates on hold until late 2014, and this announcement caused traders to lose their appeal for the U.S. dollar. Aside from that, Big Ben and his men expressed openness for more QE down the line as they highlighted the dim economic prospects in the U.S. Although recent economic data from the Land Down Under hasn’t exactly been on the up and up, I think the Aussie could continue to benefit from the surge in risk-taking. To top it off, gold prices jumped above the crucial $1700/ounce hurdle, which means more positive vibes for the Australian dollar! Long AUD/USD at market (1.0635), stop loss at 1.0575, pt1 at 1.0700, pt2 at 1.0750. Happy Australia Day, by the way!